I haven't been posting much on my blog recently because I just returned home from a trip to Europe. My husband is in Germany for the next month on business, and since we both used to live there, I decided this was the perfect opportunity to use his company's footing the bill for his plane ticket to plan a trip. I'll probably be sharing little facets of the trip in small, separate posts rather than doing one long, endless post. This particular post is about our last night of the trip - I know I'm doing this backwards, but oh well. This is my blog. I does things hows I wants to. When my husband and I lived in Germany, we lived in the town of Schweinfurt. It's about a two hour drive from the Frankfurt Main airport. Since international flights to the U.S.generally leave in the morning, we would always get a hotel in Frankfurt the night before so we didn't have to worry about getting up at the crack of dawn to make our flight. When I found out I was coming to Germany, I contacted Lenore Appelhans of Presenting Lenore since I knew she lived in Frankfurt. I suggested we get together for dinner the night before my flight back home, but being the gracious person that she is, she actually suggested that my husband and I stay at their place the night before my flight home (he's still in Germany on his business trip so he didn't fly home with me). We arrived at Lenore and Daniel's around 3:00 in the afternoon and were immediately greeted by their three adorable cats, which if you read Lenore's blog, you already see on a weekly basis every Tuesday in a feature she calls Cat Tuesday. 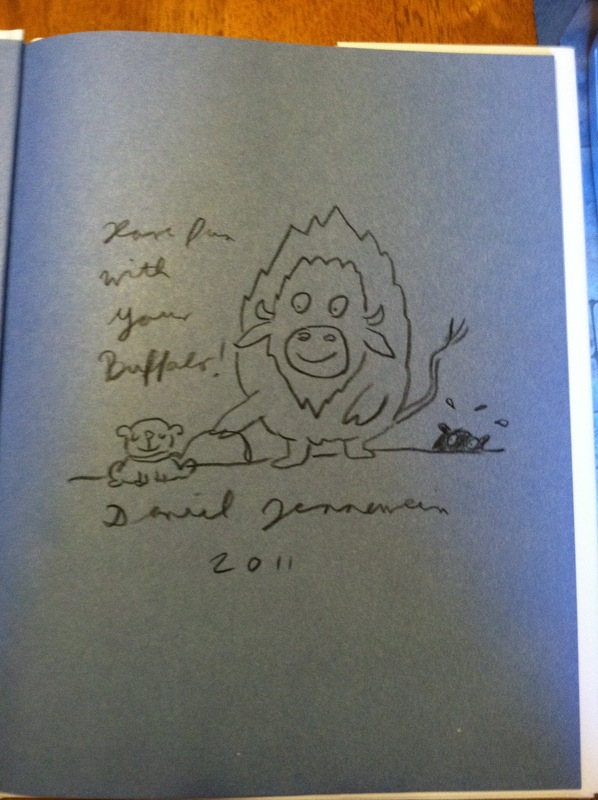 After shooting the breeze for a while, I produced the copies of the Buffalo books from my suitcase and asked Daniel if he could sign them for me. Well, he did one better. 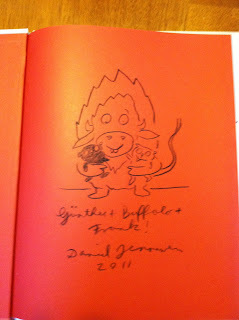 He created an impromptu Buffalo drawing in each book and asked me what I'd like the Buffalo to be doing. 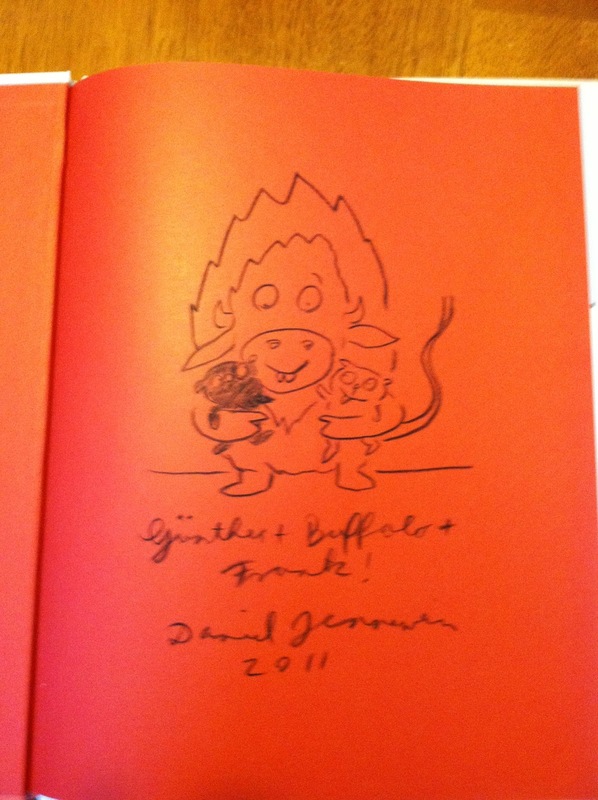 Since he was so smitten with my dogs, I told him to draw the Buffalo with Frank and Guenter, our two pugs, which I had already showed him many pictures of on my iPhone a few minutes prior. 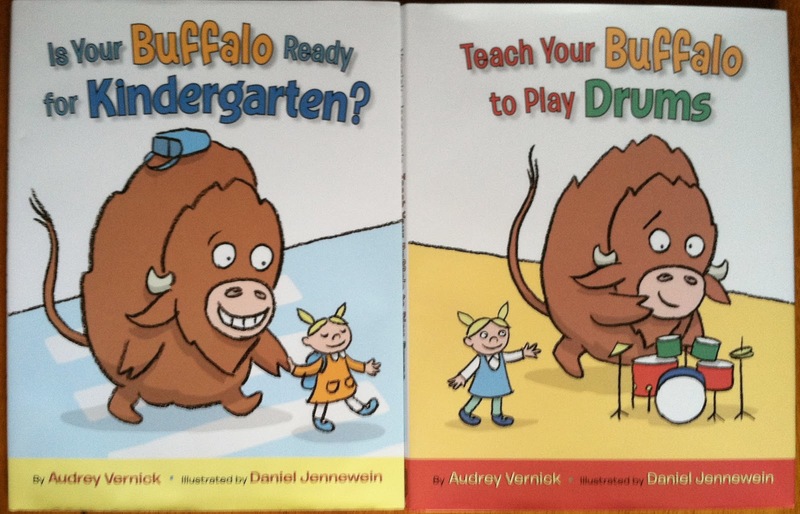 While Daniel was drawing my Buffalo pictures, they were both gracious enough to show me their Top Secret Book Project they've been working on together. I can't say anymore about it since it's still in the editing stages, but I was bursting with glee to be able to see a book project in process. 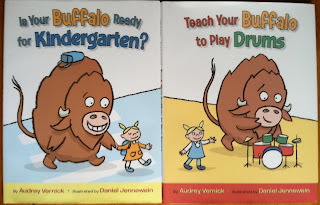 I'm always telling my students that the process is more important than the final product, so that is why seeing a "work-in-progress" stage of the publishing process is very exciting to me. After getting all in a dither at being to read Top Secret Book Project, my giddiness continued as I drooled over Lenore's YA book collection, and she even let me take some of them home. By the time she was done, I had to rearrange my suitcase so that I could fit eight new books in it. When we left their apartment to go to the airport the next day, I thanked Lenore for all the books, she told me she'll expect to see those book in an "In My Mailbox" post. I told her that wouldn't be a problem at all. Although maybe for this week I'll have to call it "In My Suitcase" instead of "In My Mailbox." A few hours later, after the torrential rain stopped (thankfully one of only two times it rained on our trip), we walked to a nearby restaurant called Frankfurt & Friends, and it was during that walk that I couldn't help but admire their neighborhood. It's within walking distance of so many things, and whatever's not in walking distance, is just a short tram or subway ride away. It kind of made me wish that our experience in living Germany a few years ago had been in a bigger city with more things to do.Schweinfurt is a nice, clean city, but it was fairly isolated in terms of cultural and culinary experiences. While Frankfurt is certainly not the most beautiful city in Germany - not even close - it has a New York vibe about it, where neighborhoods feel like their own unique city. 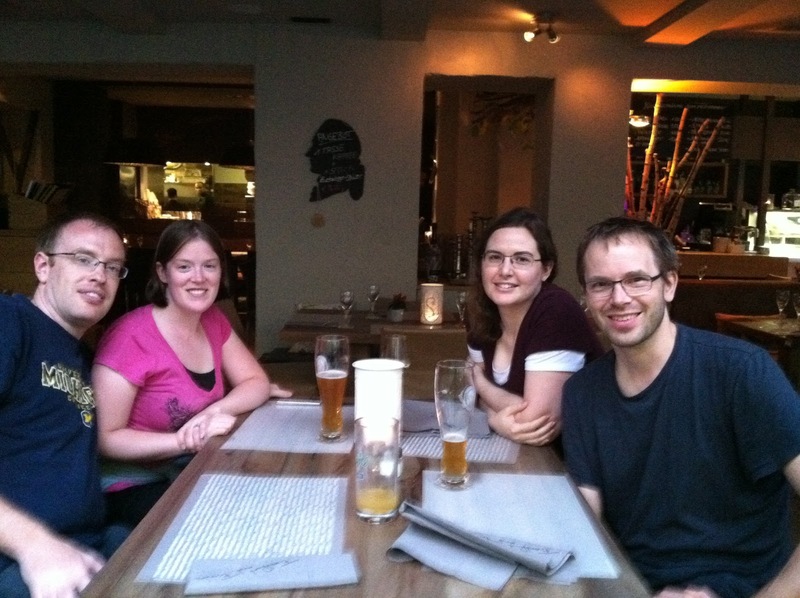 Frankfurt & Friends was a cool, sophisticated restaurant with traditional German food, but also international selections as well. The main thing I cared about though in terms of restaurant selection was making sure I got to drink one last Hefewiezen before flying home. German beer... nothing beats it. At dinner Lenore and I probably bored our husbands as we talked about books and blogging. I liked being able to hear from someone who has perspective on both sides of the aisle, as a book blogger, and also someone who is familiar with the publishing industry. 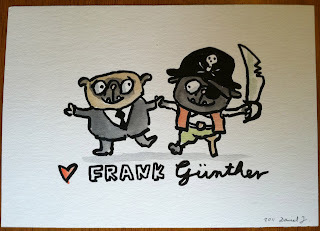 When we got back to their apartment, Daniel endeared himself to me even more by asking if we'd like him to make a watercolor of Frank and Guenter. I was touched by his generosity and thanked him profusely. This is definitely going in a frame! The book blogger and the YA community has been kicked to the floor and stomped on for quite some time now but Lenore showed the very best that this community has to offer. Not only did she open her home to two people she'd never met before, but she and her husband were more than generous with their time and talents. So thank you Lenore and Daniel. I will be forever grateful for your kindness. I hope we can meet again someday. What a fantastic day with fantastic people! How awesome!! I'd be all giddy about the drawings and the inside info on the Secret Project. 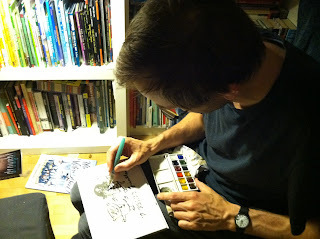 I met Lenore once (at BEA) and I could immediately tell she is warm, sincere and a super nice person. 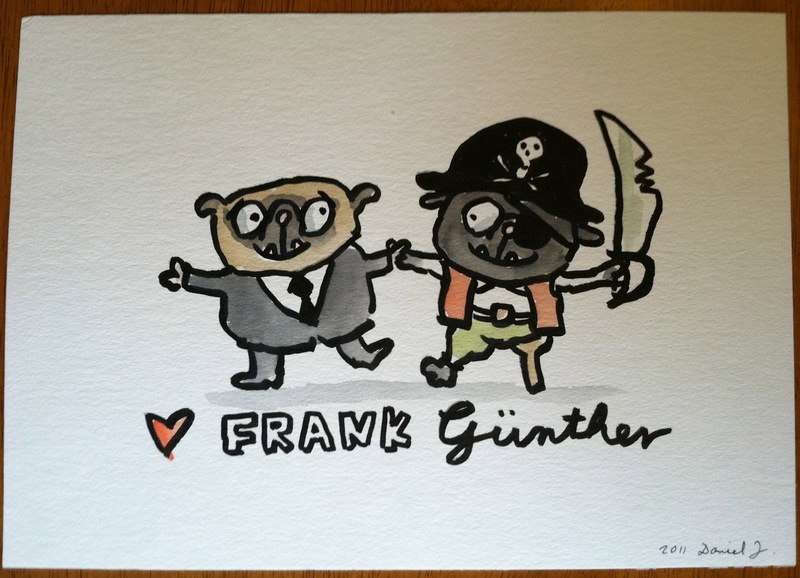 the watercolor of Frank and Guenter/Günther is adorable! sounds like a wonderful end to your vacation! welcome home! Em, interesting you noticed the spelling discrepancy. Daniel spelled his name the proper German way, which would have caused everyone here in America to mispronounce it, thus the reason we spelled it Guenter instead of Günther. 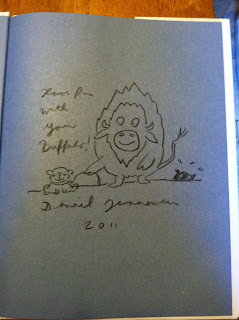 Lenore's blog IS awesome -- how completely cool that you got to hang out with her and talk books. Lucky!